Describing somewhere in Mexico as being “located in the Sierra Madre mountains” may conjure up images of high, possibly snow-capped peaks and rugged scenery, but does very little to pin down the location. Mexico has several Sierras Madre (literal translation: Mother Ranges). The three main Sierra Madre regions in Mexico are the Western Sierra Madre, Eastern Sierra Madre and Southern Sierra Madre (see map). 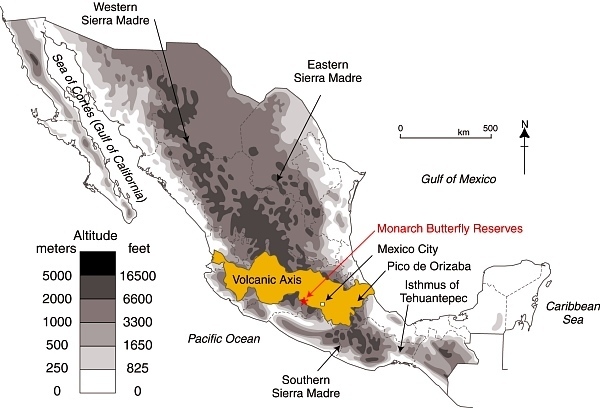 Location of Volcanic Axis and Monarch Butterfly reserves. Basemap: Figure 3.1 of Geo-Mexico; all rights reserved. The Western Sierra Madre extends only as far south as the states of Nayarit and Jalisco. Its counterpart on the eastern side of the country is the Eastern Sierra Madre (Sierra Madre Oriental) which is older, lower and less rugged. Between these two major mountain ranges are mid-elevation basins and plains. At the southern end of both the Western Sierra Madre and the Eastern Sierra Madre is the Volcanic Axis. The Southern Sierra Madre (Sierra Madre del Sur) lies south of the Volcanic Axis, largely in the state of Oaxaca. 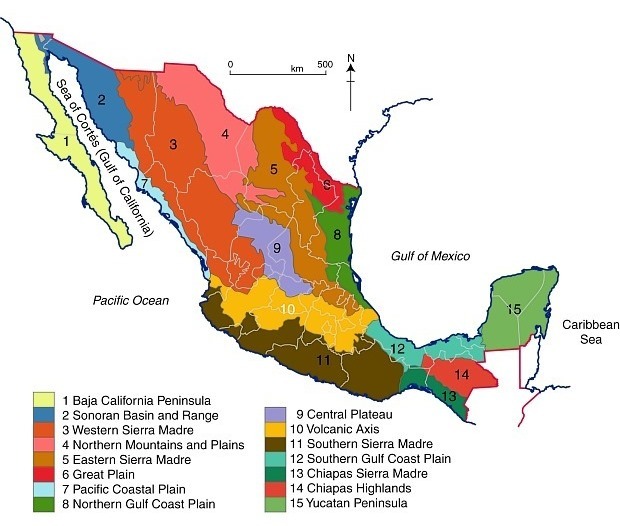 The details of Mexico’s physiographic regions are complex, but the basic relief pattern of these three Sierra Madre regions, separated by the Volcanic Axis and mid-elevation basins and plains, is fairly simple. It is therefore disappointing when we read references to the Sierra Madre regions that are geographically inaccurate. Despite the efforts of the National Geographic, it was not long before journalists published articles giving the precise locations of the sites, and visitors started to flock to see this marvel of nature. The establishment of reserves has now brought a measure of sanity and control to access and most visitors now behave respectfully. One of the latest in the long line of journals and magazines to erroneously refer to the site of the Monarch reserves as “in the remote Sierra Madre mountains” (but lacking the original excuse of the National Geographic) is the Canadian Geographic in its December 2013 Annual Wildlife Issue. The general tone of the article is helpful, and it rightly emphasizes the need to protect habitat along the entire migration route between Canada and Mexico, so why mar the overall quality by making such a basic error of Mexican geography? Let’s help educate readers by making it clear that the Monarch Butterfly reserves are not in any Sierra Madre, but are in the Volcanic Axis! Other Comments Off on What is the elevation of Mexico’s cities?